It’s been a heady time for the best of the best in Colorado golf. Earlier this year, two twentysomethings born and raised in the Centennial State earned PGA Tour cards for the first time: Wyndham Clark and Jim Knous. And on Saturday, two of their female counterparts — Colorado natives who grew up in the state — followed suit on the LPGA side. 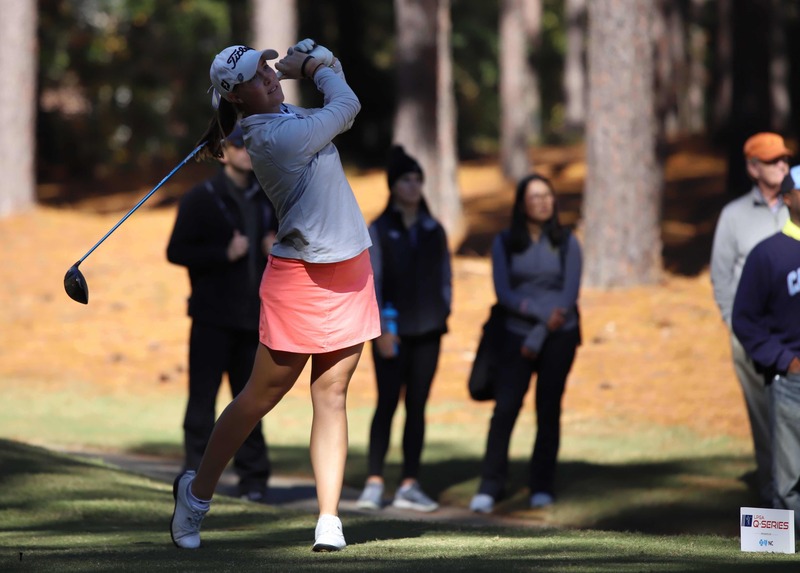 Jennifer Kupcho of Westminster and Becca Huffer of Denver not only obtained LPGA Tour cards for 2019 through the inaugural Q-Series that concluded on Saturday in Pinehurst, N.C., they did it with plenty of room to spare. As for Huffer, the 2013 CoBank Colorado Women’s Open champion and Symetra Tour veteran also landed in the top 10, in 10th place. She closed with a 73 to post a 3-under-par 573 total. Also earning a card on Saturday was University of Colorado junior Robyn Choi, who’s qualified in Colorado for the last two U.S. Women’s Opens. Choi birdied two of her last three holes on Saturday to land an exemption on the number, tying for 45th place. After also coming into the final day in 45th place, Choi played her first eight holes in 4 over par. But she went 2 under par the rest of the way to tie for the final qualifying spots. Choi closed with a 2-over-par 74 to finish at 10-over-par 586. Choi accomplished the feat of qualifying for the LPGA Tour despite starting 79-79 in the Q-Series. The rest of the way, she posted scores of 67-76-74-69-68-74. While Huffer (left in an LPGA photo) will start her rookie LPGA season early in 2019 given that’s she’s long been a pro, Kupcho confirmed on Saturday that she’ll defer becoming an LPGA member until after her final college season at Wake Forest wraps up in May. Kupcho, who will graduate in May with a degree in communications, has finished sixth, second and first individually in her first three NCAA championships. Choi (below in an LPGA photo) will have the same option as Kupcho. Amateurs were given the possibility of a deferment for the first time this fall. By winning the 2018 McCormack Medal as the top women’s amateur in the world, Kupcho would have automatic spots in next year’s U.S. Women’s Open and Ricoh Women’s British Open — but only if she remained an amateur. But she said she plans to go pro before the 2019 U.S. Women’s Open (May 30-June 2), so she’ll need to qualify to get in the field. Kupcho has played in two U.S. Women’s Opens, finishing 21st in 2017. In a year in which she won an NCAA individual title, has been the No. 1-ranked women’s golfer in the world, helped three U.S. national teams to titles in international competition and posted her first top-20 finish in an LPGA event, Kupcho achieved a bigger-picture goal on Saturday. The 21-year-old Littleton native qualified for the LPGA Tour in her first try, and made it look relatively effortless. Kupcho’s only over-par score in the Q-Series came on opening day, when she carded a 1-over 73. She finished 27 strokes ahead of the final players who earned their LPGA cards. Her runner-up showing will give her priority getting into LPGA tournaments over players who finished below her in the Q-Series. Huffer, who like Kupcho won two state high school titles in Colorado, likewise met the standard with plenty to spare — 13 strokes in her case. Indeed, it’s quite an accomplishment for two golfers who have both been CWGA Players of the Year over the last decade — Kupcho three times and Huffer once. Huffer, a Denver native and current Monument resident, demonstrated she might be on the verge of a breakthrough with a strong season on the Symetra Tour. The 2012 U.S. Women’s Open qualifier finished 21st on the 2018 Symetra money list, with three top-10 finishes, including a runner-up and a third place. Huffer, a Littleton High School and Notre Dame graduate, is 28 years old. She won the CWGA Match Play title and Junior Stroke Play in 2005 as a 15-year-old. Huffer reportedly is the first Notre Dame alum to earn an LPGA Tour card.